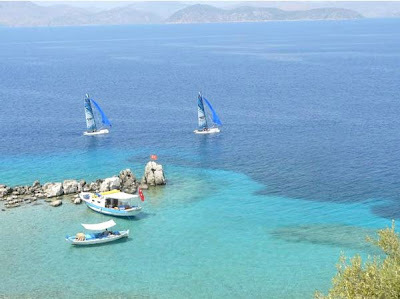 It seems that boths teams are full committed to their sailing programs besides all s*** going on with courts. USA Tri with a new mast, a modified central hull and some techie gadgets. Check how relaxed crews are, after machines were allowed less work for them, and more for some "privileged" finger pushing the right buttons...! 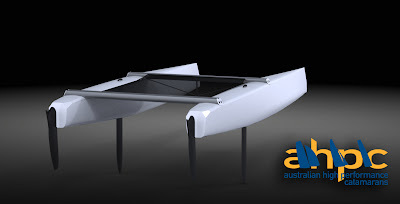 When good things just get better... a brand new power machine from Australian High Performance Catamarans (AHPC). With that brand name and their history you know what you get when buying a F18 from these guys! Congrats to Greg , Brett and the entire AHPC team for this new project. 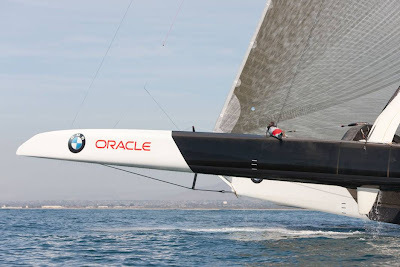 The New York Supreme Court today ruled that the 33rd America's Cup, scheduled in February 2010, must take place in a venue in the Southern Hemisphere as per the strict reading of the competition's governing document, the Deed of Gift, or in Valencia, Spain, as the only exception to that rule. “This is a disappointing result as we were certain that Justice Cahn's May 2008 decision allowed the Defender to chose Valencia or ‘any other location',” said Lucien Masmejan, Société Nautique de Genève (SNG) legal counsel. 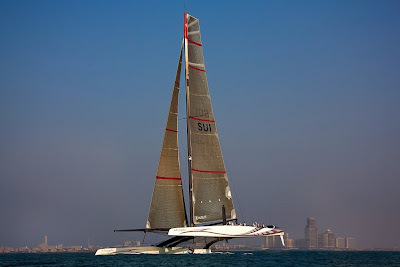 “Ras Al Khaimah has put enormous time and effort into this 33rd America's Cup project. We thank them and feel sorry for this unexpected result out of the New York court”. “We are satisfied, however, as Justice Kornreich confirmed that the Deed of Gift Match will be conducted under SNG rules as she had already ruled in a previous court order,” added Lucien Masmejan. 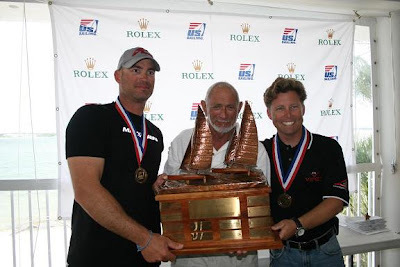 SYZ Foiler: Record attemp and a bow lost! 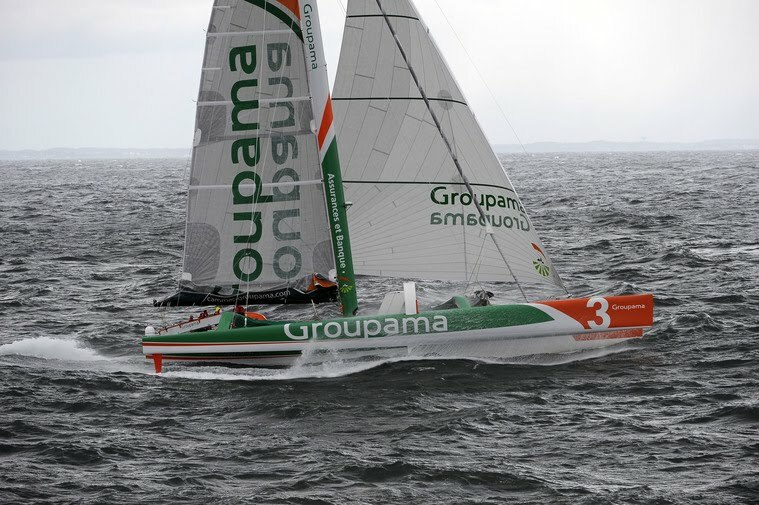 Today, at the Race HQ for the Jules Verne Trophy in Paris, Frédérique Granado, Director of external communications at Groupama and Franck Cammas, skipper of the maxi trimaran, presented the crew who will be setting off on their latest adventure from 1st November onwards. 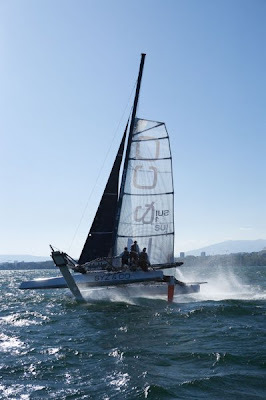 Their mission is to break the round the world record under sail, held since 2005 by Bruno Peyron on Orange 2 with a time of 50 days and 16 hours. “It has been cool and windy. 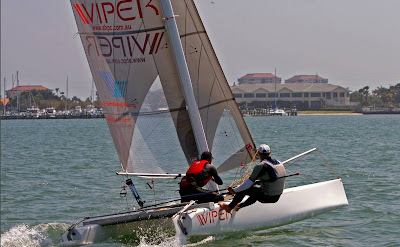 Today was really good conditions 12 knots at the start and then fading to 5 knots by 1pm. 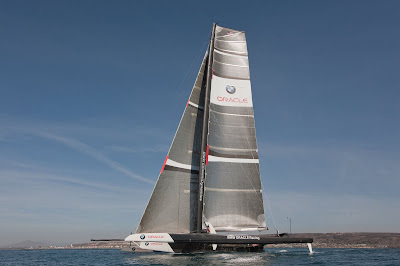 A new breeze then blew in 12 – 15knots. Seas were just a small chop. Overall leader at this stage in John Casey and John Williams. They are going very quick. Boats are doing very well with almost no problems and anything that needs adjusting is minor. 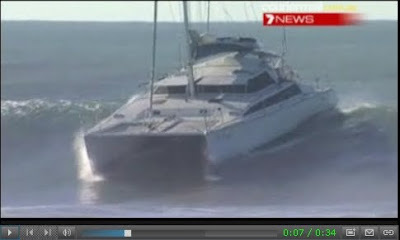 Everyone is surprised by the performance and how hard the boat can be pushed down wind. We should have some more feedback and photos over the next few days. 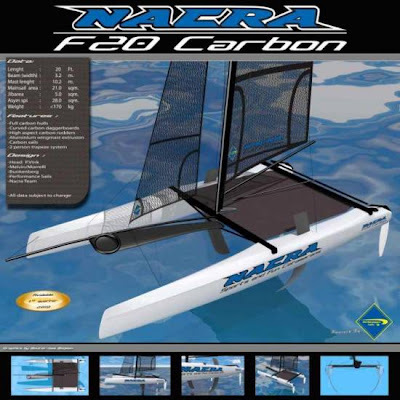 "Nacra is proud to announce the upcoming launch of its new flagship, the NACRA F20 Carbon. 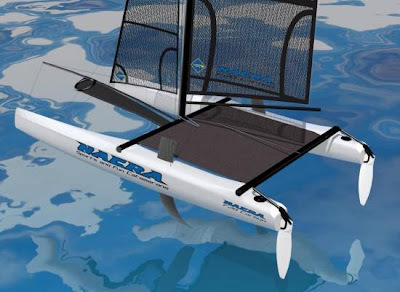 This latest addition to the Nacra range is a new high performance 20 ft catamaran. 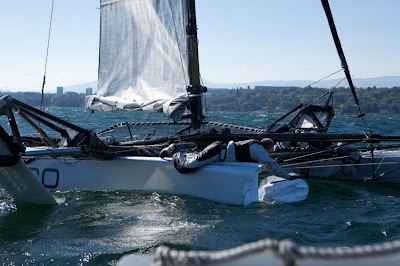 Peter Vink, head of the development team: “ The whole development team is very proud to share the first information about the new Nacra F20 Carbon. We have been working with the best-of-the best in the maritime industry to ensure that this is truly a “king of the beach” boat. It will be bigger, wider and faster than anything in-or outside its class”. Although nicknamed “Babyzilla” by the team, it will still be a boat that can be sailed by the local clubracer and be able to win at it’s first outing at the clubrace. 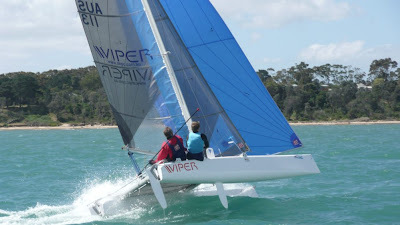 Peter Vink:”We took all the best features and characteristics of our current F18 Infusion, which has won the last two F18 Worlds, and applied it to the new boat, as an example: the rudder system, mast extrusion, beams and some other small bits and pieces, this way we have proven technology on the new F20 Carbon”. 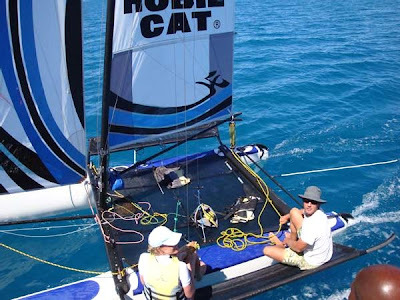 The development was done by world renowned designers, Melvin & Morrelli for hulls, Niels Bunkenburg, A cat guru for the foils, Performance Sails for the rig & sails combined with the in-house knowledge at Nacra." Pete Melvin:”It is not a coincidence that the hull shape of the new F20 Carbon shows resemblance with the floats of the AC boat, we were able to take the knowledge we gained at the AC project and scale it down to the F20 Carbon. The most noticeable and distinctive feature is the chine that runs from the bow backwards on the hull allowing the water to flow away from the hull. 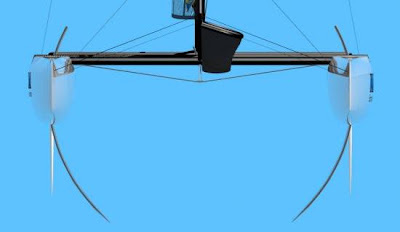 Combining the chine and wave piercing bow with the upperdeck shape reduces drag piercing trough the waves both upwards and downwards”. 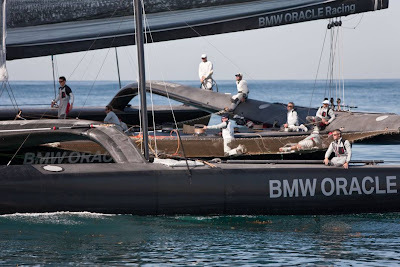 Regular production will start any moment and the first boats will be ready to be delivered to the customers in the first months of 2010." 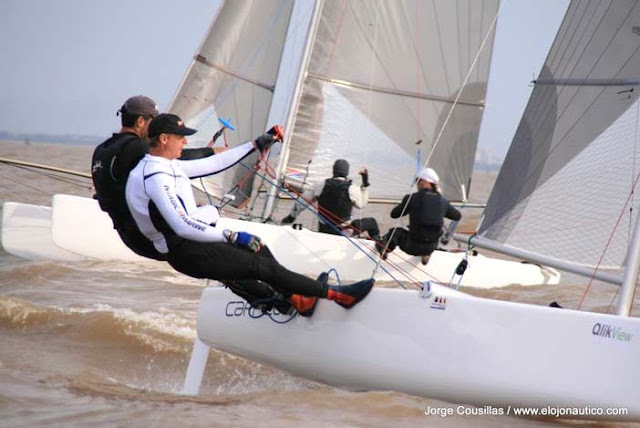 Lucas Gonzalez Smith has never participated in any F18 Worlds, though some crews here were able to go. 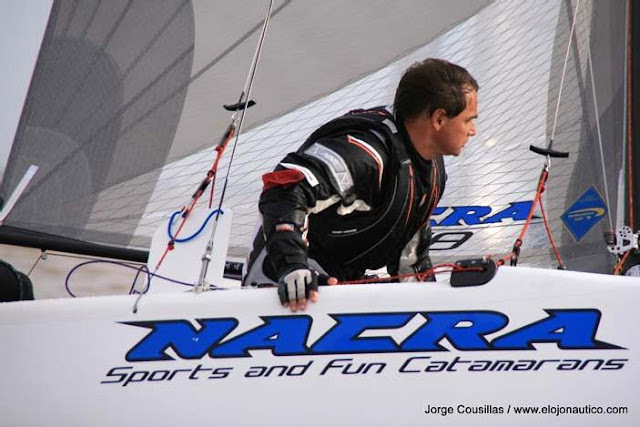 He is being sailing all his life and in 2007 he discovered the F18 as he joined our Racecat project. 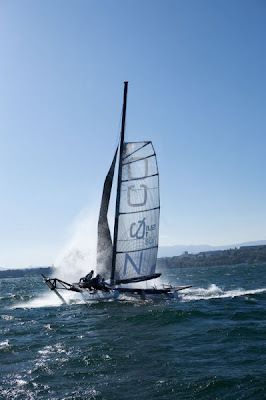 Since then he sailed, race and promote the new class in a previous 100% monohull community with his Laser friends. Now Lucas is behind the local Cap project but was invited to sail an Infusion as the local Caps are being constructed. 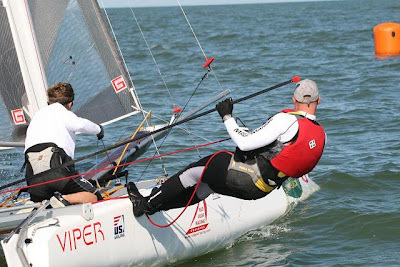 In a tough fight with his brother Cruz and Ian Rodger, Lucas finally trimmed the Infusion and got more comfortable with his teammate, boat owner and Nacra local dealer, Mariano Heuser to win the last 6 regattas for a tiny 2 point lead over the 2nd. 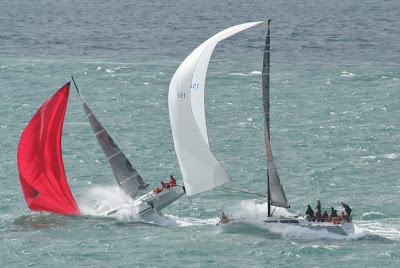 Real close racing between the Infusion and Capricorn, where the crew finally decided the championship by a small margin. All bullets were owned by the 1st and 2nd crews overall. 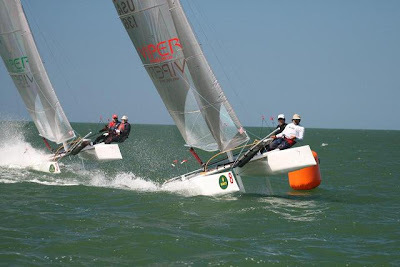 So you can have the best boat, but to win you also need to be the best sailor, the F18 provide high competive racing between several brands. 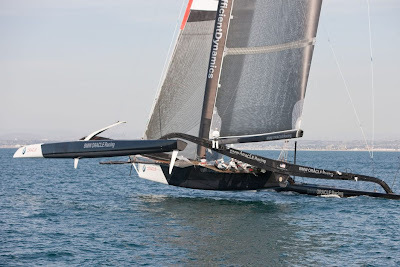 Our RC with some problems and weight handicap did well maintaning the rythm above 6knots. 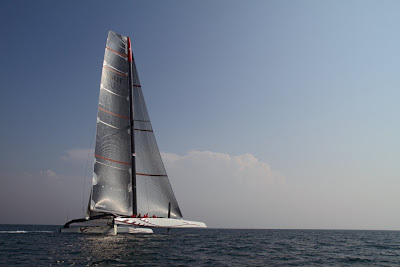 RC II is on its way for early 2010 along a new wing mast. The RC I completed its goal, that was creating a class from scratch, now is time for bigger things and a new updated design. 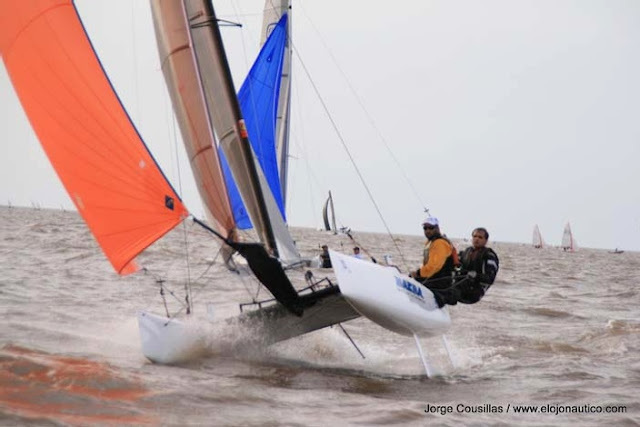 Tornado local sailor, Esteban Blando, took the local F18 to some close situations with a handicaped weight boat, we hope Esteban can sell his Marstrom ;) and join the class full time! So I´m really glad we could get Cat racing down here, now we need to keep costs down to get a bigger and competitive class. Thanks to Esteban for his guts racing against the best F18s on the planet (and really good crews) with the RC. Also many thanks to Andrew Landenberger and Felix Egner from Landenberger One Design for their support from the 1st day when I contacted them for a 1st set back in 2007. 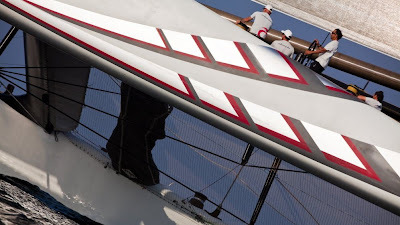 Their sails are top notch and were responsible for the extra performance of our 'old school' hull. 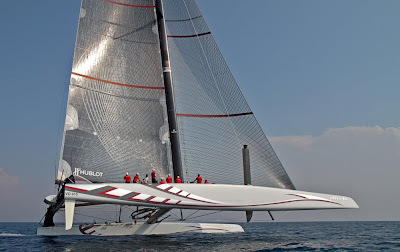 We will equipe our new F18 design with their sails of course! 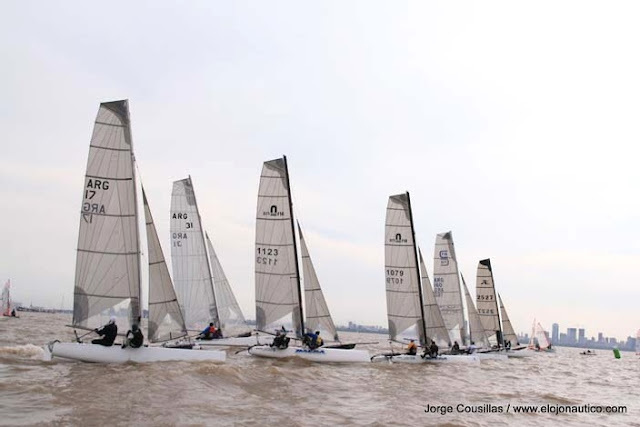 2nd Arg Nationals: 5,6,7 December.